I love handcrafted toys and thought it would be fun to write a Christmas story about a toymaker. 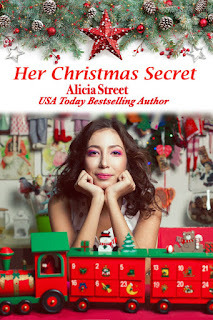 My novella in the Sweet Christmas Kisses 3 boxed set is about a toymaker named Lila who is desperate to help her sister's family and courts a cold-hearted investor, but she learns that Christmas has a way of bringing surprises where they are least expected. Lila told herself not to worry. She could do it. She could make it all work out. She had to come through for her sister. A towheaded boy tore past her in a toy jeep, and Lila swerved to the side of the aisle. She joined in his jubilant giggle, ignoring the knot in her stomach. How could she not be happy in G. R. Bolton’s? She loved this toy store. Lila walked through the narrow aisle, her wide-eyed gaze sweeping over the brightly colored games and dolls and stuffed Santas and robots. She could hardly believe two of her handmade wooden Lila Belle toys would be featured this holiday season right here in New York City in this glossy, high-end store in midtown Manhattan. It was a far cry from her down-home mail order business and her consignments in small local shops run by some of her friends out in Long Island’s rural North Fork. Now if only she could convince Mr. Bolton to carry her toys in every store in the chain and recommend her to an investor. Was it even possible? Tall order. But life had left her with little choice. The clock was ticking and she had to come through. Remembering what her BFF said about being bold and stepping out of her comfort zone, Lila gripped the boxes in her arms to steady herself and sauntered down the aisle toward Inez Acosta, the assistant manager of the store. Darn. Inez didn’t hear her. Carter always told Lila to make her voice louder, bigger, to not sound so timid. Following Inez to the back of the store, Lila cleared her throat, ready to speak up, but then she recognized the storage closet. Was it locked? She set the boxes down and tried the handle. “No, don’t open that,” Inez said, rushing toward her. “Tavi is the shop’s pet. Just have to keep him out of sight for now.” Inez pulled a kitty treat out of her pocket, handed it to the puss, and shut the closet door. Was this her chance? Lila’s mouth went dry. She wasn’t any good at talking to important people. Especially men. Luckily the main buyer for Bolton’s New York City store was Jane Stoltz, a friendly easygoing woman, and they’d hit if off right away. But the head of the whole chain of Bolton toy stores? She’d searched out G. R. Bolton on the internet and found the seventy-two-year-old head of a blue blood Connecticut family that owned all kinds of businesses looked like a demonic version of Winston Churchill wearing a stern and condescending expression in every photo. Lila went through a door that Inez pointed out, flipped the light switch on the stairwell, and descended into a basement filled with rows of floor-to-ceiling shelving stacked with boxes of all sizes. She jumped when she heard the furnace rumble and turned to see a glaring work light through the open door of the walled-off area that enclosed it. Then a man stepped into the doorway of the furnace room—a man so handsome she had to press her lips together to keep back a sigh. Lila wasn’t the type of woman who went ga-ga over every good-looking guy. Even as a teen, she’d been more down-to-earth, hanging posters of snowy landscapes and prints of paintings by Matisse in her bedroom instead of the latest Hollywood hunk. So why was her heart suddenly fluttering like mad? And why couldn’t she stop staring at him? Oh no! Those eyes were looking right back at her. Watching her swoon over him. She shrank down slightly behind the boxes in her arms, embarrassed that he’d caught her ogling him. “Getting warmer up there now?” he asked. Even his voice was a dream. Warmer? Oh, she was warm all right. So brilliant. So witty. No wonder he just nodded and turned back to his work. It was a relief though, since Lila would have been totally unable to pull herself away from the intensity of his gaze. She set the goods on the floor, found a ladder, and propped it against the street-side shelves. Picking up the tablecloths and boxes, she held on with one hand and climbed to the top shelf near the ceiling. As she tried to shift the boxes onto the shelf, one of them slipped to the side. When she grabbed for it, all the boxes went tumbling, crashing noisily to the floor. Just as she saw the hunky repairman peek out to see what was happening, Lila felt the ladder skidding sideways. Only to be caught in the embrace of his strong muscular arms. Having this woman in his arms sent Graham’s lousy mood packing. He’d been grumbling ever since Bryan had called him to report the furnace being on the blink. Arriving at the store to find his grandfather was upstairs making an impromptu visit only shifted his mood from sour to bitter. Fixing things, working with his hands, solving tangible problems used to be his form of therapy. Lately even that didn’t get him out of his funk. But moving with lightning speed to play hero for this lady in his arms sure did. For a long beat he stood there, cradling her small body against his chest, unable to take his eyes off her face. It wasn’t that she was exceptionally beautiful in the cover girl sense, but those wide-set brown eyes, cute dimples, and that sweet sultry mouth… Whatever she had going, it was enough to light up the furnace inside him. “Thanks for catching me,” she said, breaking the silence. Her voice was a soft whisper that seemed to caress his cheek. A few seconds later he realized he should say something. “Oh…uh, you’re welcome.” What was wrong with him? Holding on to her like he was afraid to let go. He set her on her feet and gave himself a mental slap to get his mind clear. Graham never let women get the upper hand. Silly words, but it was exactly what some part of him needed to hear, what he wanted to be for her. Whoa. Where did that thought come from? He was about to force himself to turn away and get a grip, when she glanced up and smiled at him. He could swear a spark shot through his whole body. They stood there in awkward silence again, just looking at each other, the fluorescent ceiling lights buzzing. A tightness formed in his chest. Graham wasn’t much of a talker, but no woman had ever rendered him brain-dead like this. Almost to prove to he could, he forced himself to speak. “I got some soot on you. Sorry.” She was tiny, elfin, kind of had a boy’s body in her straight-legged jeans and bulky sweater with a goofy Santa-capped dog on it. He usually only liked voluptuous women with enviable female attributes. So it puzzled him when he reached out and brushed the soot off her shoulder and got the strongest impulse to pull her into his arms. Especially when her cheeks flamed at his touch. “It was worth it,” she said. “I mean—” She brought a hand up to cover her face. They both laughed and she gave him a warm look that lit up this dreary gray basement. At least he now knew the attraction went both ways. Heck, the attraction between them was so strong it seemed to form a haze in the air. He struggled to keep his hand from reaching out to brush away the wisps of chocolate-brown curls feathering her delicate cheeks. And then kiss her senseless. Suddenly remembering his strict rule to never make a move on the salesgirls in his stores, or any other employee, Graham took a step back, putting on the brakes. It wouldn’t be long before everyone knew the truth about him taking over the Bolton chain, and he didn’t want to be perceived as one of those unscrupulous bosses—like his grandfather. In the beginning, Graham had worked like mad in all of the toy stores, still did work more than most, right down to being resident repairman in a pinch. But even now—twelve years later—no one except Bryan, Janey, and Mac knew he was anything more than Mac’s employee, a cousin from the poor side of the family. And that was how he wanted it. He didn’t want to risk spoiling the little surprise he had planned for that cruel man who happened to be his grandfather. “Is G. R. Bolton still upstairs?” he asked. “I’m not sure. He was in the office so I didn’t see him, but I suppose I should try to introduce myself.” Her fingers played nervously with the hem of her sweater. “You must be a glutton for punishment. Luckily I came in through the stock entrance.” He didn’t bother to mask the sarcasm in his tone. Graham shrugged. “Big news. How long have you worked here? I’ve never seen you before.” But then he’d been on the road. And judging from his inability to turn away from this woman, it was time to make another trip to the Midwestern stores. Or maybe an overseas toy-buying excursion. So she wasn’t an employee. The rush of relief that flooded Graham at her answer took him by surprise. “Are you coming to the family day with your husband and kids?” Okay, so he was showing his hand, but he had to find out. He remembered that brand. His buyer, Janey Stoltz, had been impressed with her stuff. Usually Graham was grateful he could hide the fact that he was a Bolton. It served to hold off some of the female vultures looking for a rich husband. Of course the persistent ones always managed to find out how much he was worth and got their hooks ready for fishing anyway. But he could tell this enigmatic angel in front of him wouldn’t be like that. And for the first time since he was a kid he actually wished his last name had never been changed—just so he could see her eyes light up. And his angel fell from her pedestal. Naturally she’d like to meet him. His cousin Macaulay Royce Bolton, who owned five boutique hotels in addition to his share of the family holdings, had been listed as a prime catch in every major gossip rag. Every woman on the planet was after him. Did Graham really think this one was above all that? “Can’t help you there,” Graham said, falling into his repairman role, a guy who could never compete with the likes of Mac Bolton in most women’s eyes. “Don’t know him or travel in those circles.” Why not play it to the max? He usually worked from home, so he’d probably never see Lila again. “I wonder if Bryan could introduce me,” she muttered, then bit on that pretty lower lip of hers. So she was just like all the rest. One of those aggressive money-hungry females. And since Graham had worked like a dog to make his fortune instead of inheriting it, he had no intention of ever getting raked over the coals by a conniving woman. “Well, I’ve got to get back to work,” he said, his tone flat. “And I’d better get going. Inez wanted me to leave when she locks up.” She looked up at him. “Thank you for saving me in that fall, Graham. I might be in the hospital right now if you hadn’t,” she said in a voice so soft and sincere he almost wanted to revert to his original fantasy of who she was. Almost. Jaw clamped firm against his nonsensical thoughts, he said only, “Have a good holiday,” and turned toward the furnace room. He told himself not to look back, but as he neared the furnace room he couldn’t resist glancing over his shoulder to watch Lila disappear up the stairs. Tossing all logic aside, Graham raced to the sink and did a quick wash-up. If he hurried, he might be able to catch up with Lila before she left. Invite her to get a bite to eat or something. He told himself it would only be an experiment to see if he could unravel what puzzled him about her and why he was so drawn to her. So he’d take his repairman game a little farther. Just for tonight. And then he’d never have to see her again. So good, Alicia! Love it! LOVED this. Delightful! I can't wait to read more!! Thanks! I've really been enjoying these first chapters by my fellow SRR authors!